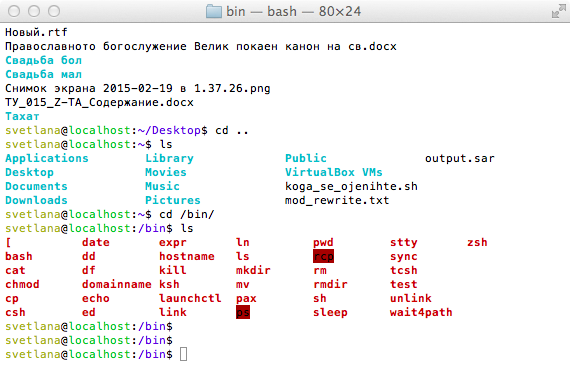 How to set-up Virtualbox shared folder to Copy files from PC Host and Guest Virtualized OS? Running VirtualBox Host is an easy thing to set-up across all Operating Systems. Once you have it sooner or later you will need to copy files from the VM Host OS (that in my case is GNU / Linux) to the virtualized Guest operating system (again in my case that's again another Linux ISO running indide the Virtual Machine). 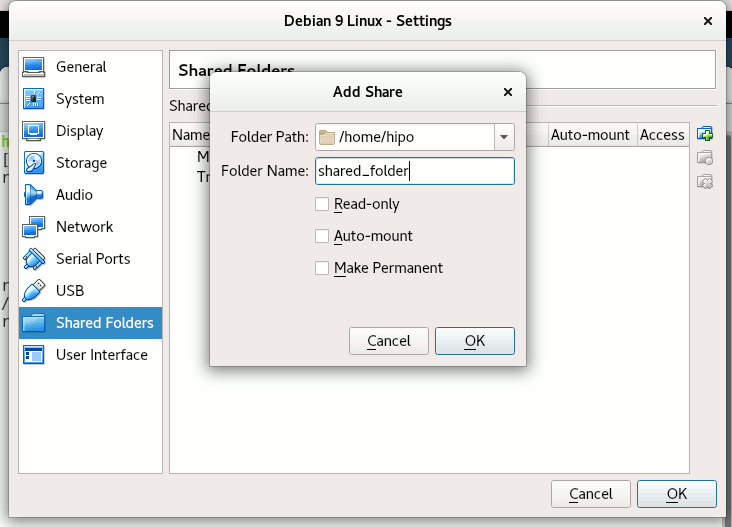 Below are steps to follow To use Virtualbox Shared Folder functionality to copy files between VBox and your Desktop / server Linux install. If the mount fails and there are no files inside the mount point it might be because the virtualbox-dkms and virtualbox-guest-dkms packages might be missing on the Host OS. From Transient Folders add whatever directory you want to be shared from your local notebook / PC to the VM. Depending on whether you would like to mount the shared folder only for reading files (choose Read Only) to make it a permanent shared folder (and not just for the one session of current running Virtual Machine until its killed use Make Permanent) or check Auto-Mount tick if you want the shared_folder mapping to be mounted on every VM boot. 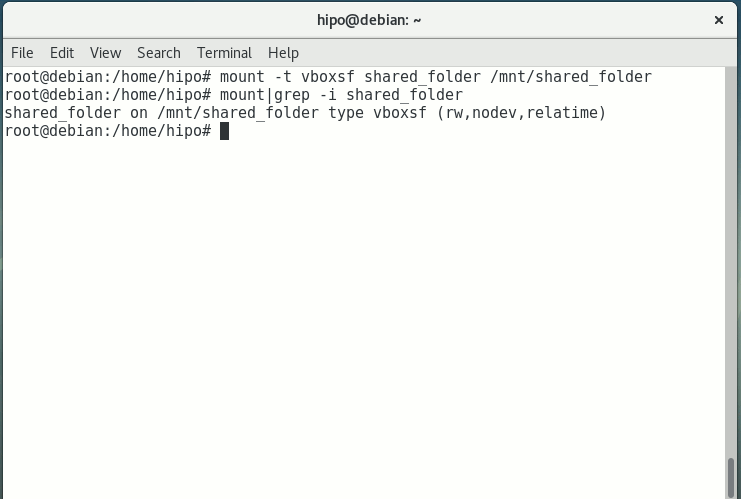 Once the shared_folder directory location is set-up from GUI menu click OK and in order for the settings to take effect, you'll need to restart the VM Guest with Linux (use halt command from terminal) or Power Off the Machine via the VBox menus. You have it mounted and ready for file share between Desktop -> Virtualized OS. Bear in mind that above mount command has to run as root (superuser) to succeed. 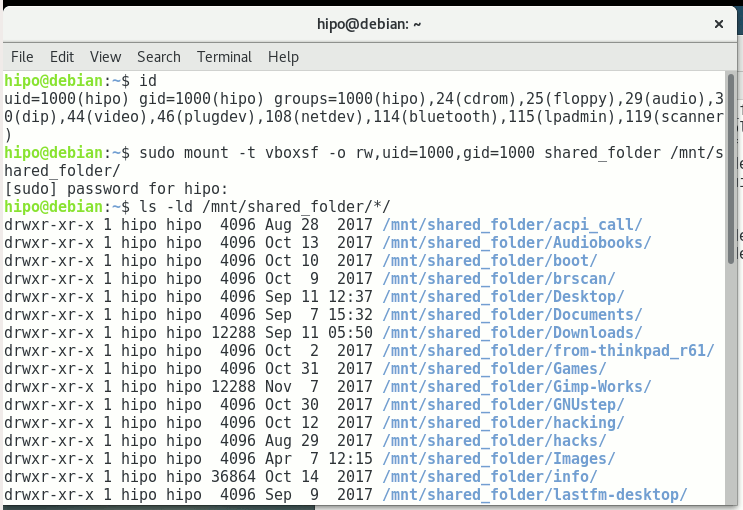 You now could copy files from your Host OS (running the Virtual Machine) and the Guest OS (Virtualized OS) using /mnt/shared_folder mount point without problems. The example is if you want to share files between VirtualBox installed Linux and the Guest (Desktop / server) OS, however at many cases mounting your Host OS directory for root users might be not very practical but, instead you might prefer to do the mount for specific non admin user, for example I prefer to do the shared folder mount with my pointed non-root username hipo. 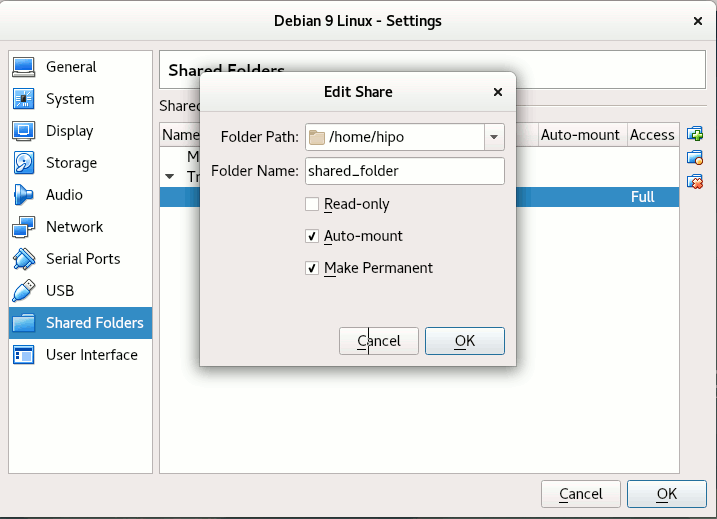 If you need the shared_folder to automatically mount next-time you boot the virtual machine quickest way is to add the mount command to /etc/rc.local (on Debian 8 and Debian 9 and newer Ubuntu Linuxes rc.local is missing by default to enable it to work like it worked before read follow my previous article ). The more professional way to auto-mount on emulated OS VM boot time, you could add the vboxsf mount definitions to /etc/fstab with your favourite text-editor mcedit, nano, joe etc. 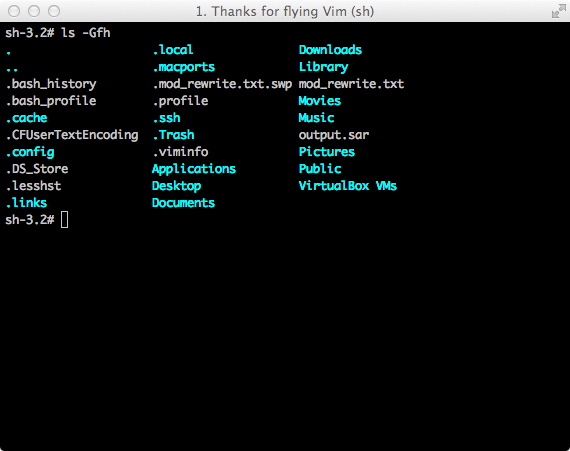 … (for me that's vim). Note that you will want to change 1000 / 1000, id / gid with the ones of the non-admin user you would like to add to mount it for. One note to make here is if the uesr is added to vboxsf the line for /etc/fstab to auto mount to mount for root user and non-root will be identical. This error might be caused because of Insert Guest Additions CD Image might be not properly enabled and installed using the ISO provided VBoxLinuxAdditions.sh shell script. Other common reason you might get this error if you have mistyped the Folder name: given in Shared Folders -> Folder Path -> Add Share for example I have given shared_folder as a Map name but as you can see in above mount -t vboxsf, I've mistyped share_folder instead of the correct one shared_folder inserted. In some VBox releases this error was caused by bugs in the Virtual Machine. One useful tip is to be able to check whether a Virtualbox Virtual Machine has a configured shared_folder (if you're logging to manage the machine on remote server – nomatter whether you have logged in with VNC / Teamviewer / Citrix etc. or via SSH session. If you're pissed off too already of GNOME 3 Unity / GNOME 3 Flashback and KDE Plasma as I am you perhaps are looking for something more light weigth but you're not okay with default Debian Cinnanom GUI environment or you don't feel confortable for system administration jobs and programming with XFCE then perhaps you would like to give a try to something more old school but build with good design in Mind. Those who are fans of the evil genius Steve Jobs (as Richard Stallman use to call him), definitely Remember NeXT company and the revolutionary Graphic Environment they tried to develop NeXT Step then you'll be happy to hear about GNUStep which historically was called AfterStep and is a Free Software remake of NextStep graphical environment for Free and Open Source operating systems (FOSS) such as GNU / Linux and FreeBSD / OpenBSD / NetBSD etc. 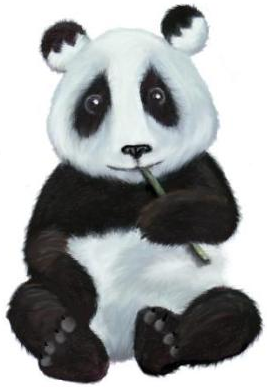 Amanda the Panda is the mascot of Window Maker. She was designed by Agnieszka Czajkowska. The good thing about Window Maker and the complete bunch of desktop environment GNUStep is it much lighter and less complex than the more and more becoming bloated modern Free Software graphical environments, it definitely easifies the way the user interacts with basic browsing with Firefox / Opera, terminal code writting or command system administration and basic chat functionalities such as with Gajim or Pidgin and basic email writting operatins be it with some text email client such as Mutt or with Thunderbird. Its great also to reduce the overall load the Operating System puts on your brain so you can have more time to invest in more useful stuff like programming. After all simplicity in Operating System is a key for an increased productivity with your computer. Besides that stability of Window Maker is much better when compared to GNOME and GNOME 2 fork MATE graphical environment which nowadays in my opinion is becoming even more buggy than it used to be some years ago. 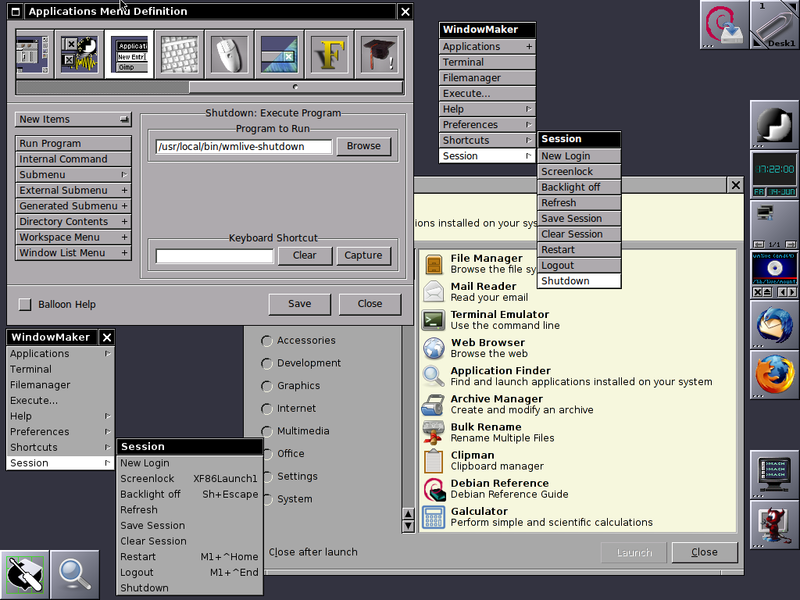 "Window Maker is an X11 window manager originally designed to provide integration support for the GNUstep Desktop Environment. 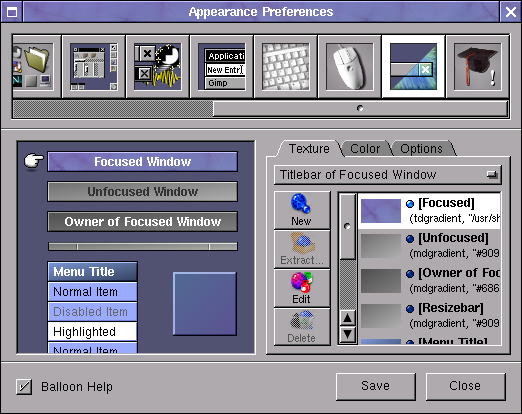 In every way possible, it reproduces the elegant look and feel of the NEXTSTEP user interface. It is fast, feature rich, easy to configure, and easy to use. It is also free software, with contributions being made by programmers from around the world. Window Maker has a stable user interface since many years and comes with a powerful GUI configuration editor called WPrefs, which removes the need to edit text-based config files by hand. It supports running dockapps which make everyday tasks such as monitoring system performance and battery usage, mounting devices or connecting to the internet very easy. Please see the features section for more specifics on what Window Maker can do, and how it compares with other popular window managers." Window Maker is bundled with a number of useful applications which gives ability to put Dock applets easily for easily intearcive desktop update of current Weather Report, Monitoring Network Traffic, TV Player (video4linux), laptop battery info dock, CD player and Volume control management app, text editor, pdf viewer, integrated Mail application, Calculator, RSS Reader, GNUStep games and much useful things to customize from the desktop resembling many of the basic features any other graphical environment such as GNOME / KDE Provides. All Wmaker configurations are stored inside ~/GNUstep/ (Your user home GNUStep), so if you're to become its user sooner or later you will have to get acquired to it. Wmaker is very minimalist and the performance is killing so Window Maker is perhaps the number one choice Graphical Environment to use on Old Computers with Linux and BSD. Well yes it is true Window Maker is not a spoon for every mouth, those who want to have more confortable desktop environment better look out at other options as Window Maker is Unix / Linux graphical environment that fits better hackers, computer developers and system administrators. Anyhow if you have some old family member that has to use an old computer architecture and the person is only to use mainly just browser to check email, youtube and basic surfing then Wmaker will be a great choice as it will consume little CPU and Memory much less than the heavy and computer resources sucking GNOME and KDE. I've historically used Wmaker also with its teminal emulator rxvt (VT102 terminal emulator for the X Windows System) which is a kinda of improved version of xterm (the default terminal program bundled with Xorg server), but for those who are already used to Gnome Terminal nice tabs perhaps that would be not the terminal of choice. Most "custom" shortcuts are used to launch specific applications. To add your own keyboard shortcut for an application, go to the "Applications Menu Definition" panel in the Preferences app. Select the application item in the menu for which you want to create a shortcut, then use the "capture" button to capture the keystrokes you want to assign to that item. 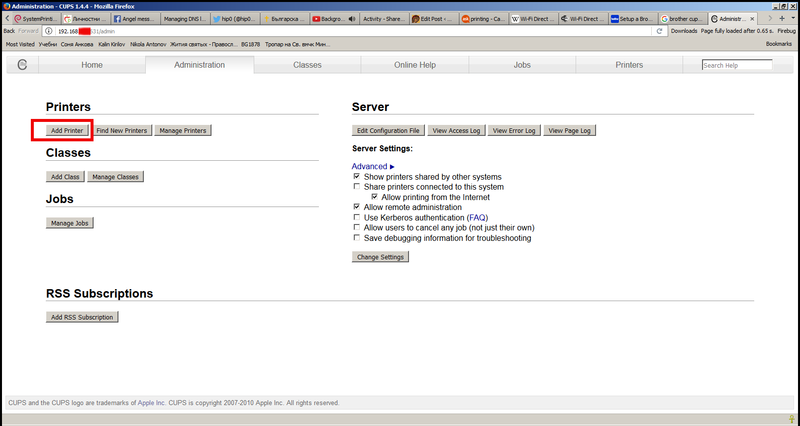 In the screenshot, I've assigned Mod1 + W to open Firefox. If you're too lazy to install and start configuring wmaker, there is a Window Maker LiveCD, you can run Window Maker through LiveCD in Virtual Machine such as VirtualBox to get feeling what you're about to get if you install and start using Wmaker on your Computer. Well at first with Window Maker you might feel confused and quickly irritating missing the already established way to work with your computer, but that's just for a starter sooner you will realize, that for using a limited number of applications for work wmaker, makes you much more efficient. Moreover using your computer with Wmaker can rewire your brain circuits to think a little bit different. 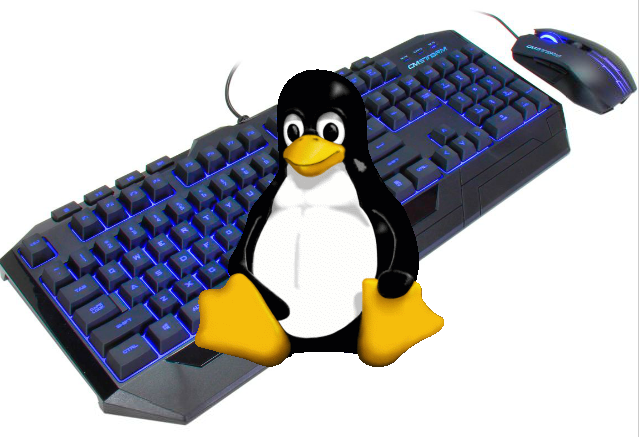 If you're a GNU / Linux user and you happen to buy a backlighted keyboard, some nice new laptop whose keyboard supports the more and more modern keyboard growing or if you happen to install a GNU / Linux for a Gamer friend no matter the Linux distribution, you might encounter sometimes problem even in major Linux distributions Debian / Ubuntu / Mint / Fedora with keyboard backlight not working. But wait, there is hope for your joy to be made complete. If you prefer to have the keyboard colorful backlight enable and disabled from X environment on lets say GNOME , here is how to make yourself an icon that enabled and disables the colors. That's handy because at day time it is a kind of meaningless for the keyboard to glow. I've recently installed Debian GNU / Linux 9.1 Stretch and on Ubuntu 16.10 Yakkety Yak and as an old school true gamer addict decided to play some games to recall the good old memories from the past of the glorious DOS games times, when all was simple people was real and there was no terrible people dividers such as Facebook / GooglePlus, no skype fuzzy craziness and no people watching all time at their mobile smart phones like zoombies . Well anyways, so I wanted to play my favourite DOS games Terminal Velocity, StarGunner, Raptor, Heroes of Might and Magic 2, Doom II, Duke 3d etc. etc. the list goes on and on – BTW What's your favourite old school DOS Game?? DOSBox switched to max cycles, because of the setting: cycles=auto. If the game runs too fast try a fixed cycles amount in DOSBox's options. error and why it happens? is spit out by Dosemu. So how to solve DRC64:Unhandled memory reference dosemu error? 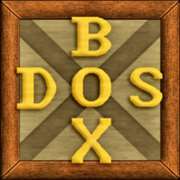 By default DOSBOX places its configuration at Linux / BSD / *nix-es at home folder /dosbox – e.g. ~/.dosbox/ the naming of dosbox.conf might differ according to dosbox version and the respective Linux / BSD distro, on Debian and Ubuntu Linux usually the naming includes a version number. for me and everything seemed to run fine. I've only run a handful of games but so far it seems to be working well. 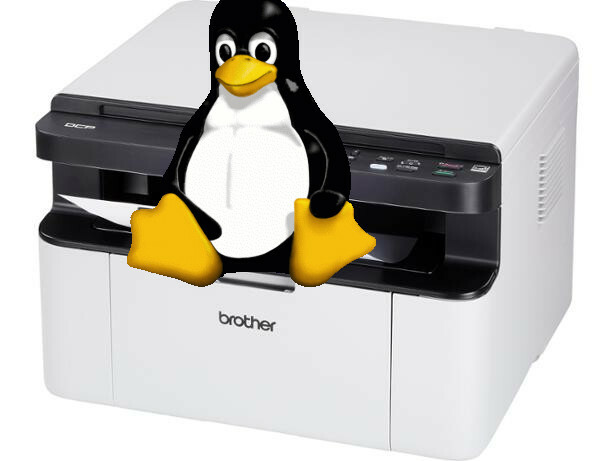 I've recently bought a new Printer model Brother DCP 1610W and as in my home I have already a small Linux router and a web server where this blog and a couple of other websites runs and I need multiple PC / notebook / mobile phone enabled people to print on the Printer easily pretty much like a Printing server for a Small Office environment. To do that of course I needed it configured to be accessible remotely for print via LAN and Wireless network. The task is not a complex one and printing remotely over the network is a standard thing many company organizations / universities and univerities does for quite some time and hence nowadays most printers are network connect ready so you just have to place them inside your home or corporate network and use the time to configure them via their web configuration interface or even some have their own embedded wifi adapter, as well as many printers nowdays can even be ready to print directly by just connecting the Printer to the Wi-Fi network and installing its drivers on a Win host. 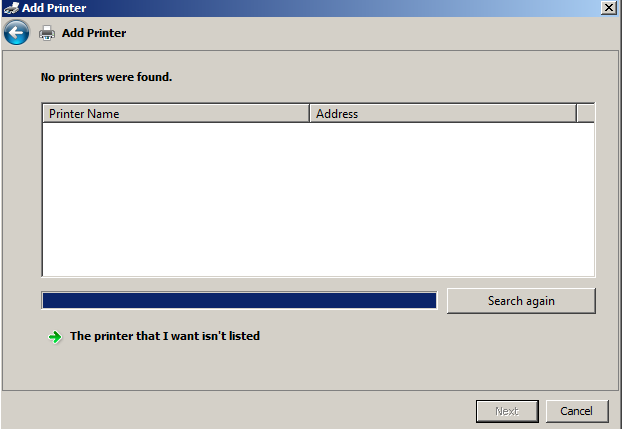 Anyhow the most common way for both home printer configurations and corporate I'm aware of still is to Share the printer via Windows Server or Win Server Domain so anyone connected to the Network to be able to Add the printer via Winblows. In the case i'm going to describe below my home the Wi-Fi router is connected to an 5 Port Network Switch (HUB) which on its hand is connected to the Linux router which serves multiple things (a Linux router, a hosting server (web server and a database server hosted, a mail server, traffic proxy server, a firewall and a NAT router), I decided to Share the printer to Wi-Fi connected and LAN clients directly switched via an UTP cable to the switch by using the good old Linux Samba Sharing server. I did not actually do that for a really long time hence before I started I did some quick research to get an idea on the general steps to partake to succeed in Sharing the Printer over the network of this Debian's Wiki SystemPrinting Guide was mostly helpful. Your printing should work normally without cups-pdf and ghostscript-cups packages installed but I install them just in case if PDF processing is problematic you can skip that. It is also useful to install sane and sane-utils packages if you're going to use the brother's scanner capabilities. Note that considering that all packages installed fine and the CUPS service is running, this should have set a proper printer into /etc/printcap a short database used to describe printers. printcap file is being used by UNIX's spooling system and allows you to dynamic addition and deletion of printers, for Linux / *Nix hosts which have more than one printer connected and added in CUPs records for the various printer goes there. 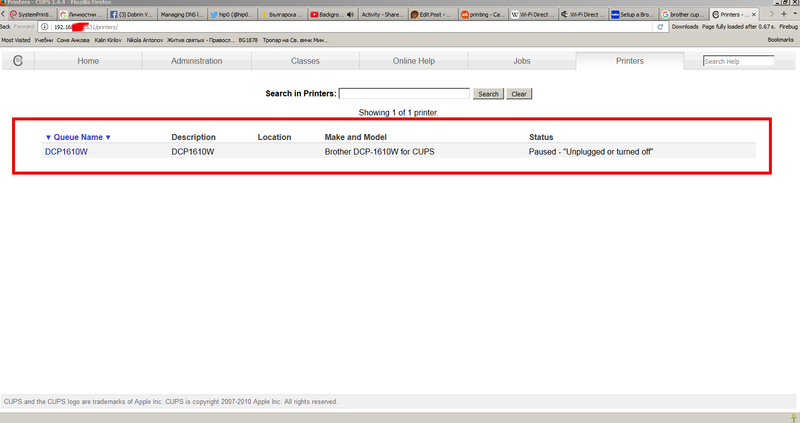 CUPS has a nice web interface for setting up and administering printers and print queues. Use your favourite browser (Firefox, Opera, Chromium, lynx, elinks – yes the great news is console / terminal browsers are also supported well by cups web iface) to display interface and add a printer via the Administration screen. If you are asked for a username and password see here. There are three sections. The first is for local printers; that is, printers which are usually attached to the machine you are using. These are very often printers using a USB connection but can be parallel or serial port printers. Adding a USB printer is a common occurance and one should automatically be detected as a local printer and a URI (Unified Resource Indicator) for its connection displayed on the next page. The Other Network Printers section requires you to specify the destination for the remote print queue/printer, which could be on the local network or many kilometres away. AppSocket is almost always available on a network printer and other devices and requires only the IP address of the printer and a port number. An Internet Printing Protocol (IPP) URI is the preferrred choice for connecting to another CUPS server because it is CUPS' native protocol. ipp14 is the ipp backend from CUPS 1.4 and Debian-specific. It is provided because some devices do not work with the current ipp backend, which has a stricter adherence to the IPP standard. A Line Printer Daemon (LPD) URI could be considered if the remote printing service does not support IPP satisfactorily or at all. As before, when a remote print queue is doing the filtering choose RAW as the Make/Manufacturer. 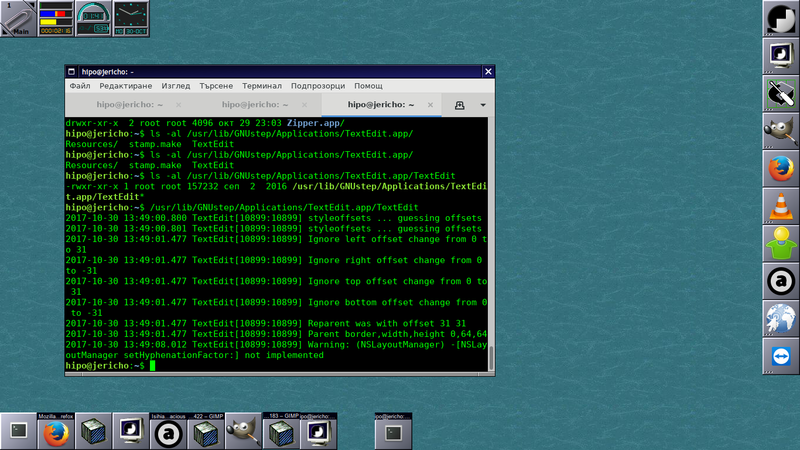 Status of Common Unix Printing System: cupsd is running. At the moment of issuing above command it shows printer is disabled because of moment of execution the printer was turned off for a while cause I was not needing it you should get usually an output of enabled and ready to print. You can setup CUPS to allow Windows machines to print to a CUPS server using an http address. First, install the samba package. When you are asked to use WINS, say yes. Next you might want to set setup your /etc/cups/cupsd.conf file by default CUPS would listen to LPD's port 631 if you don't have a strong firewall isolating you from the Internet on port 631 you might want to change that port to another one lets say to Port 49651. This will listen on port 49651 from any network. You may use some other port number besides 631. Note that the dynamic and/or private ports as specified by the IANA are in the range 49152 through 65535. Also, this will only allow computers from the local network to print to the CUPS printers. Lastly, select the Brother downloaded from Internet or the one that's available on the Install CD, for any other vendor printer if it is lets say HP Printer or Canon to install use the respective provided driver or as a last resort use the Generic section driver labeled MS Publisher Color Printer. root@linux:/# ps axu|grep -E "smb|nmb"
This section needs updating as you can setup print server via samba print sharing just by uploading drivers. This allows Samba to authenticate against a domain controller for acces to the printer queue. 1. Assuming you have cups to set up the printer on Debian as described above. 2. 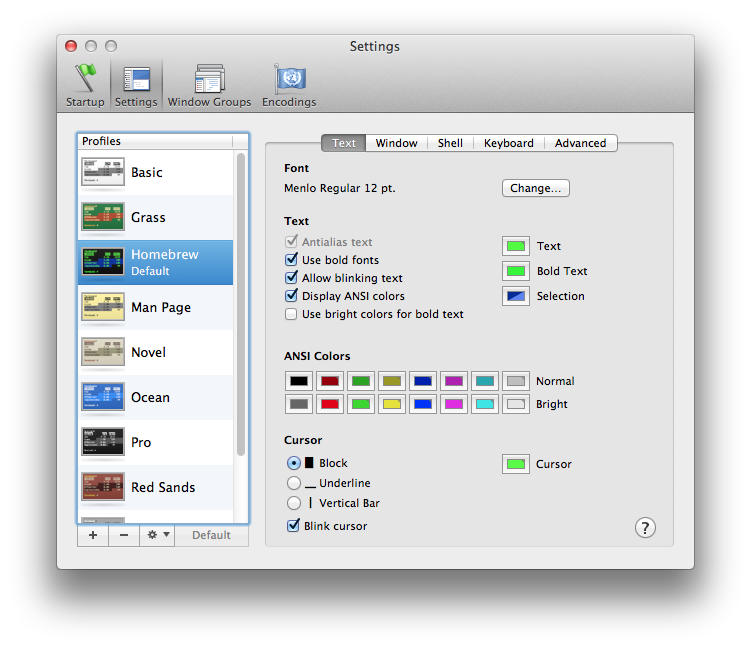 On the Mac (OS X 10.4+) start Print and Fax from System Preferences. Use the + button to add a printer. 3. Look first in the "Default" tab. If the automagic printer-sharing has worked, and your Mac is connected to the local network properly, then the Debian-based printer should already be visible in the list. Gutenprint Printer drivers to make it printing. 4. If your printer is not visible in the Default tab, then try adding it on the "IP" tab. Put whatever helps you identify the printer in the Name and Location boxes (fields), and choose a printer driver than matches Brother DCP1610W or with another printer installed whatever you used to set up the printer on Debian . Finally Pray that God help you to make it work and press the Add button. If you prayed honestly and repenting for your sins perhaps you will have mercy and it will work, of course if not try to research online on how to fix it further by God's grace. Note that making printing work on Mac is a little bit of tricky and it might cause you some extra effort / nerves to complete. That's all folks, Thanks God the printer should be working. Enjoy! drwx—— 2 mysql mysql 36864 Nov 17 12:00 .
drwx—— 36 mysql mysql 4096 Nov 17 11:12 ..
Well that's weird? Obviously only 55% of available disk space is used and available 134G which was more than enough so I got totally puzzled why, files can't be written. Now everything become even more weirder, as obviously the disk continued to be claiming no space left on device, while in reality there was plenty of disk space. Then after running a quick research on the internet for the no space left on device with free disk space, I've come across this great superuser.com thread which let me realize the partition run out of inodes and that's why no new file inodes could be assigned and therefore, the linux kernel is refusing to write the file on ext4 partition. In a Unix-style file system, the inode is a data structure used to represent a filesystem object, which can be one of various things including a file or a directory. 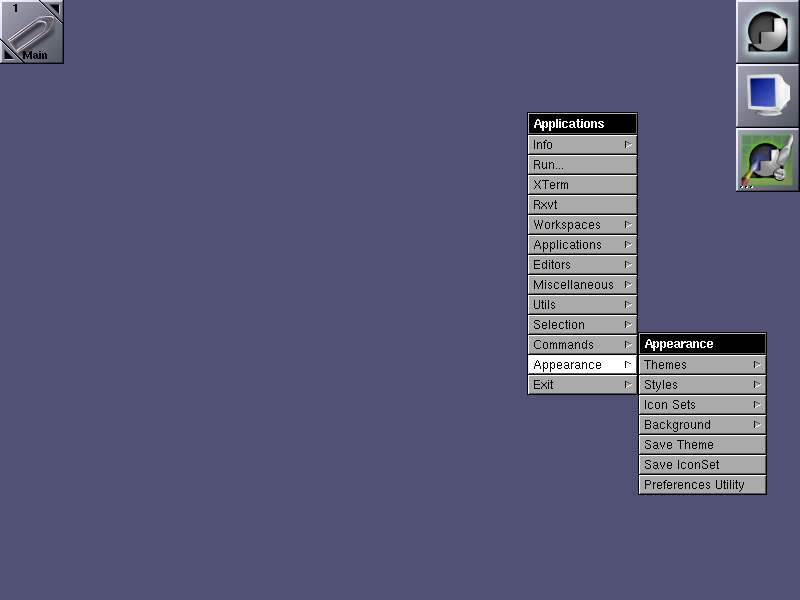 Each inode stores the attributes and disk block location(s) of the filesystem object's data. Filesystem object attributes may include manipulation metadata (e.g. change, access, modify time), as well as owner and permission data (e.g. group-id, user-id, permissions). Directories are lists of names assigned to inodes. The directory contains an entry for itself, its parent, and each of its children. And hooray by God's Grace and with help of prayers of The most Holy Theotokos (Virgin) Mary, websites started again ! I'm not blaming Mac OS developers for shipping by default Mac's console so much greyish as most Mac userbase almost never use terminals, however adding some appearance candy makes my boring digital life much more entertaining. PS1 with above string do colorize Terminal's default “username@hostname:cwd $” following alias makes by default ls (dir) command to have colors enabled (show files and folders in shiny colors like on GNU / Linux). As you see the ls command perameter -G which actually adds colors is the same like in FreeBSD (since very big part of Mac OS is based on BSD UNIX utils), -F makes directories to be marked with / and -h (stands for human readable). This maps Command + A / Command + E to (emulate) act like normal PC Home / End Keyboard key button, to emulate Page Up / Page Down keys on Mac OS keyboard inside Terminal app use Fn (key) + Up / Down arrows. its pretty hard to track on exactly which file is the backup producing the Error exit delayed from previous errors, this is especially the case whenever adding to archive directories containing millions of tiny few kilobyte sized files. 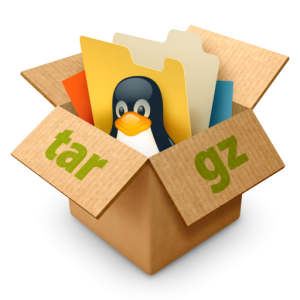 Many novice on uncautious Linux admins , might simply ignore the warning if they're in a hurry / are having excessive work to be done as there will be .tar.gz backup produced and whenever uncompressed most of the files are there and the backup error would seem not of a big issue. This year on 6th of May – saint George's day Church feast and army celebration in Bulgaria I had the blessing to be in a small village with 868 citizens – Jiglarci (Jeglarci). Jeglarci is situated about 40 km from Dobrich. Father Georgi from Jiglarci is a well known priest in Dobrich region. He is spiritual father of many priests, monks and nuns here in Bulgaria. This is the 3rd time I'm visiting Jiglarci one time I was on Great and Holy Friday – the day on which the Lord Jesus Christ was crucified and one time I was a few months ago with some brothers and sisters from Holy Trinity Church in Dobrich. This time I had the blessing to go fr. Georgi with my wife Svetlana with Russian family from moscow Mihail and Mariana, and Denica (a sister from Church in Dobrich). Each time I visit father Georgi I have the blessing to see and hear a living proof of God's existence. 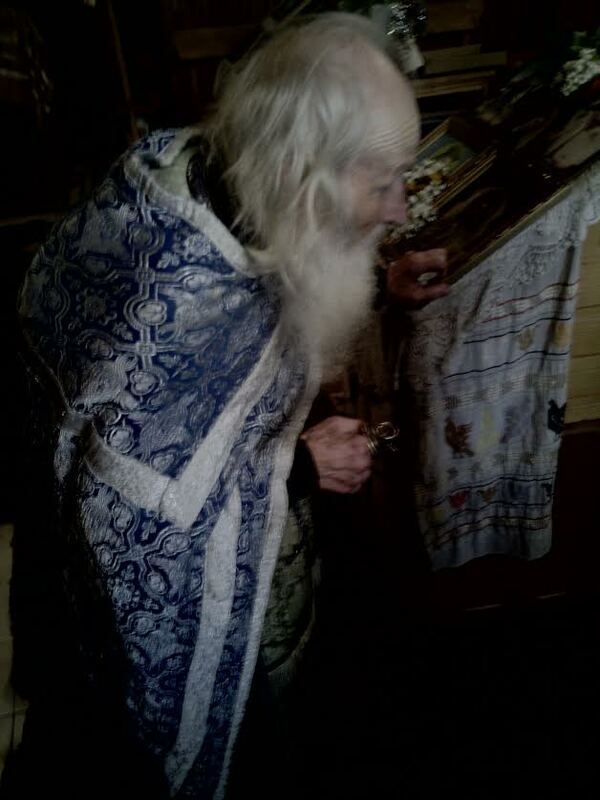 Father's Georgi from Jeglarci is famous all around Bulgaria for being one of the spiritual elders of Bulgaria. 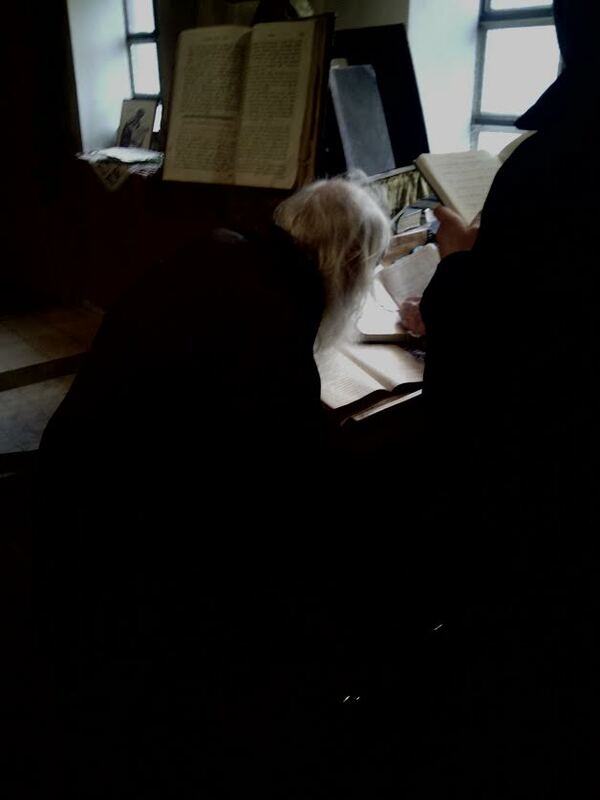 He is now 91 years old but even though his age continues his service for God (serves Holy Liturgy every day during great Lent! ), continue to preach and accept dozens of people almost daily looking for spiritual advice, spiritual help, confession, or questions on how to deal with life hardship situations. Father Georgi is known in the world under the secular name Georgi Stoyanov Peev his life is full of miracles, interesting events and wondrous facts. In communism times of atheism and Orthodox Christian faith persecutions, father Georgi was one of the many priests who underwent tortures and persecutions for his faith in Christ. Because of his firm faith of zealous priest, the Lord endowed the fr. with great spiritual gifts. In short I will mention some facts about fr. Georgi From Jeglarci life as the father is an example of a living saint, very much like another Bulgarian Church Elder (Dijado) Dobri from Baylovo. Father Georgi has been nurtured with Christian virtues since his childhood – his aunt (sister of his father) was a nun. By his own words, "Since a child, the joy of my life was in faith". Since his youth years his faith was strong and because of that God has helped him in numerous times. Fr. Georgi had 6 children 3 sons and 3 daughters. All of his sons choose the way of priesthood and are now priests in the Bulgarian Orthodox Church. His nephew fr. Stoyan is also a priest in Holy Trinity Orthodox Church in Dobrich. The father become priest while being 43 years old, by studying in seminary after feeing the call of God and need for firm believers and mass disbelieve in atheistic communist times. In seminary father Georgi studied together with his son. To be able to support himself and his family financially, he worked all kind of hard labour (sand mining near his village). His all life was labor and prayer in all his free time during studing he learned the church services, readhing the living of saints and holy bible. Thanks to the house whom he turned into a small chapel almost 20 people become priests later in Bulgarian Orthodox Church. In his priesthood fr. 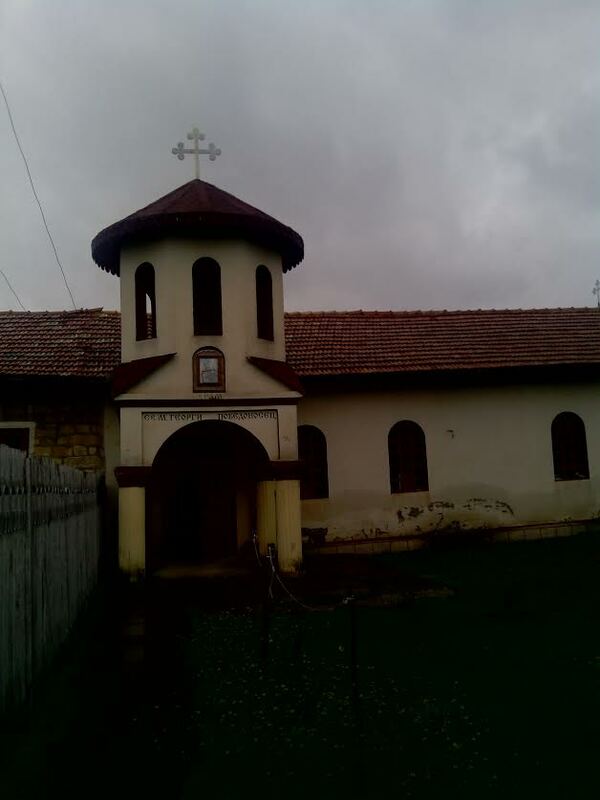 Georgi was among the minority which opposed the ungodly communistic regime, he rejected to comply with communist desires to close the Church in Jeglarci and as a responce to their closure opened as a Church his own house. He was questioned and asked for reports being increminated from local Communist authorities, threatened with death and called in police stations many times because of his refusal to stop his service in Church and preaching the Gospel. "Our Lord as a Good Father, not only listens our prayers but also reads in the hearts. In 1953 my brother Atanas was a soldier. We received a letter, that soldiers will be dismissed in January next year, this was a very long time. 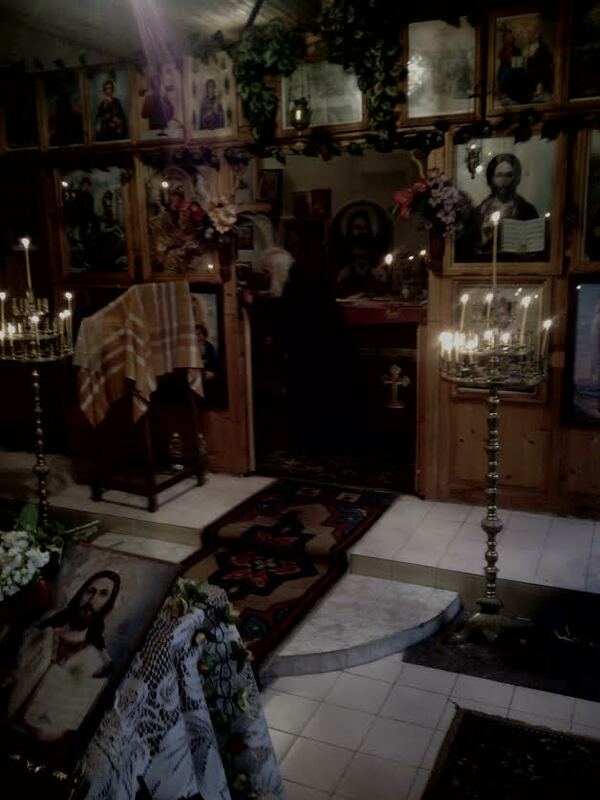 It was st. Dimiter's feast and I wanted my brother to be home for Christmas. At night I prayed the Lord, simple and by all my heart: "Lord for you nothing is hard or impossible. I beg you – in one way or another make it possible, that my brother Atanas to come home earlier. In a short while, my brother told me how in a human way everything ordered in a way that he was able to come home, 3 days after my prayer. When I received the letter on St. Dimiter's day I've prayed, the prayer was heard and God moved. The human mind is a spiritual substance connected with God. God orders things and we in a human way receive them. On the next day after st. Dimiter's feast the coy was gathered and the commander said, "Atanas Stoyanov Peichev, make 5 steps forward and start Marching!". Together with another man commander sent them in hospital, where a doctor had to inspect their health. The two soldiers took their luggate, foreseeing that they might be kept in hospital. The health check prooved they're healthy. There were 4 months until service completion but in hospital the doctor told them – "Come on go home. Your service is over". – Do you see how in a human way the things ordered. Disbelievers would say it was a coincidence but believers knows the Lord hears our prayers, when they're prayed by our whole being and with pure heart." Fasting and Prayer are lights leading to God. I was warned 3 times by our Lord about fasting significance. When we were living in North Dobrudja, following thing happened to me: " I was 15 years old. Near our village Karamankyoij a river rich of fish was flowing. One day my bigger brother cought a lot of fish from the white one. My father and all of us was tempted, we wanted eating and it was during the Great Lent. My father said, "Okay prepare the fish and let us eat, God will forgive us?" Notice he said that in faith! apostol Paul writes, 'who eat eats for the Lord and who doesn't eat- also doesn't eat for the Lord'". We have done so as well, we were big family 7-8 children, grandma, grandpa, my father, mother. Some eat others doesn't. I was in the group of those who ate. We ate and we went to bed. A sudden pain in stomach came … hard to explain. Nothing helps, a thought came to my mind: "Lord forgive me, I will no longer eat fish during fasting". The pain immediately disappeared I immediately got well. But unfortunately I was weak. On the other day my brother prepared fish again and invited me. – Genyo, come lets eat. – I suffered yesterday – I don't want. – Don't worry your pains was from something else not from the fish, come eat I beg you. I was tempted and ate. We played until night time and all was well with me. In night, I fall asleep, but suddenly the pain come again, 3 times more painful. I thought I am dying, I was all sweating. My mother and grandma tried to heal me but nothing helped. Then I turned with a prayer to the Lord: "Please Lord forgive me this time also." And out of a sudden I hear a noise like from many waters coming like from heaven. Something went through me and took away the pain. There was a flash in front of my eyes. Do you see how merciful is the Lord!" Among the many spiritual gifts of fr. Georgi is the gift of "foreseeing" (thoughts and deeds, and future). Many people who visited him later narrated the father told them things which helped them improve their spiritual life. During my first visit of the father I had the possibility to raise few questions on my spiritual life, his answers was a proove for myself that the fr. has truly the gift of sagacity. Father Georgi had many dreams during his life and many of his dreams were prophetic about future events to come. By his own words often God spoke to him in "dreams and visions". A very notable gift he has is the gift of humility and pure Godly love. He speaks in his stories about everyone including of many who tried to do him evil with profound love and forgiveness. 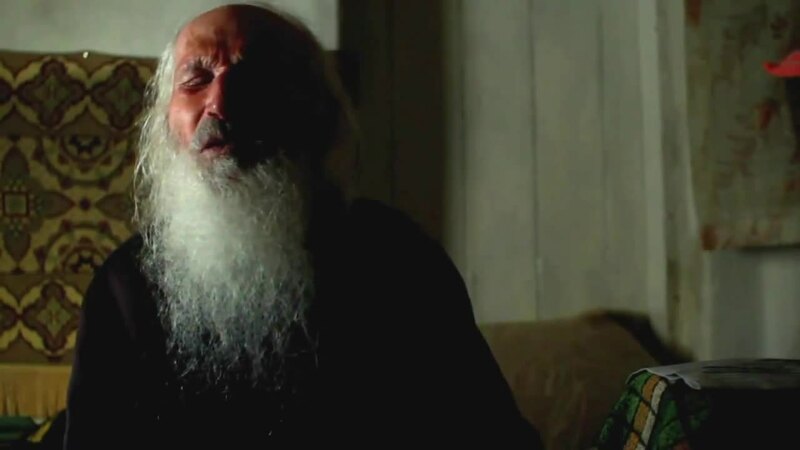 By prayers of father Georgi many miracles has happened, he openly speaks of this miracles, believing that through this the weak in faith are strengthened. The father says "Even if the whole earth is convincing me to deny what I saw and experienced with my spiritual eyes I will not forsake. His humility is sincere, he says about himself: "I am just negligible mot and the miracle is not in human deed but in God's. God uses a lot simple people and through them creates miracle to edify "the smart", those which is of God is being remembered like it happened today. Wondrous are God's deeds!" "The Spiritual deed is very hard. I have worked many kind of works, when you get tired you take a rest, and for the spirit there is no rest. What to say, how to behave, how to determine the spiritual in you, to be vigilant for your food and for body pureness for pureness of your thoughts and your heart … And of course the Prayer! This is a hard labour. The devil is trying to hit us exactly there, because in all those is the direct relationship with God. Your thought is careless, you remember "important" things, you get tired to be concentrated … And it is most harder to collect your mind and feelings and enter the heart with pure infinite faith that the Lord is with you and he hears you and then pray from all your heart and soul … So is this all easy?! And there is no end and there is no station. 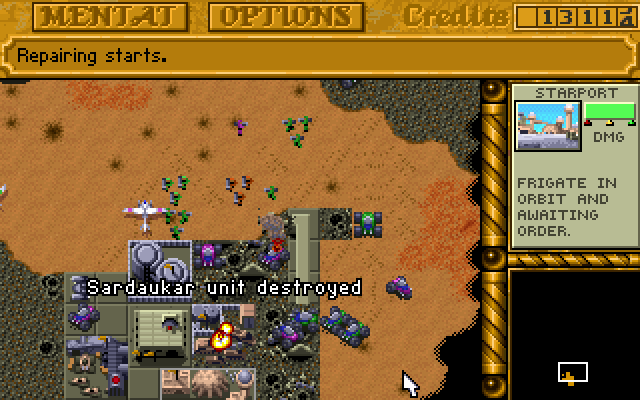 But once you live like this there is delight and you can't live no longer in another way …"
I've grown up with Dune2 and the little computer geek community in my school was absolutely crazy about playing it. Though not historically being the first Real Time Strategy game, this Lucas Inc.
game give standards that for the whole RTE genre for years and will stay in history of Computer Games as one of best games of all times. 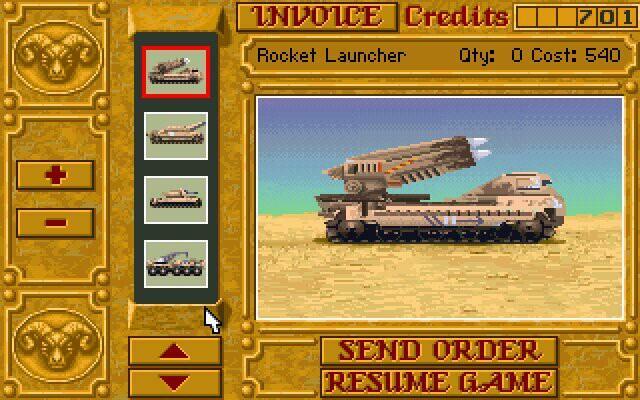 I've spend big part of my teenager years with my best friends playing Dune2 and the possibility nowadays to resurrect the memories of these young careless years is a blessing. Younger computer enthusiasts and gamers probably never heard of Dune 2 and this is why I decided to place a little post here about this legendary game. 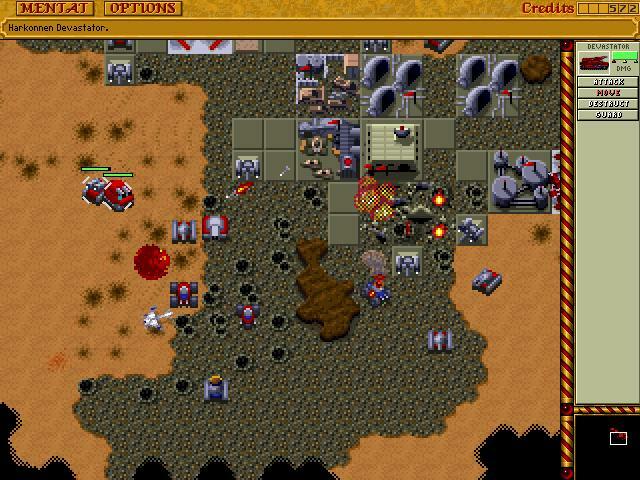 Its worthy out of curiosity or for fun to play Dune 2 on modern OS be it Windows or Linux. Since Dune is DOS game, it is necessary to play it via DOS emulator i.e. – (DosBox).